ATEME encoders: Kiev Ukraine-SNG/Outside Broadcast vans. contribution encoders and decoders, which has been certified by the European Broadcast Union (EBU) and deployed broadly around the world. Kyrion encoders enable the global delivery of high-quality SD, HD and UHD sports and news broadcasting, regardless of location. 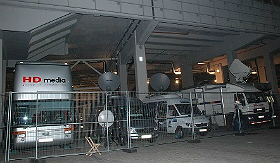 Based in Kiev, Ukraine, Engineer Service operates and rents a fleet of outside broadcast vans and Satellite News-Gathering (SNG) vehicles that regularly cross country borders. Since upgrading its fleet, the company has covered more than 15 major news and sporting events, including the Ukraine presidential and parliamentary elections and all Ukraine-based soccer games of the UEFA Champions League and Europa League. Peter Metalnikov, project manager, Engineer Service, said: "We serve a diverse international clientele who rely on us to provide reliable solutions for their broadcasting needs. ATEME’s encoders enable us to meet those expectations – and even exceed them. SNG operators love the fact that the noise level of the equipment is very low, much lower than our previous solution. Being able to offer leading-edge encoding gives us a competitive advantage."